Because of the very dog-filled weekend, Henry got 3 days off, then because I was super tired yesterday, a 15 minute dressage ride was all I could muster. There’s just not a lot of interesting stuff happening here since we’re in that “dead zone” time of year where it’s too hot to show and, thus I don’t have a lot to talk about. We did enter the event at Corona at the end of August, so hopefully Henry doesn’t pass out and die. I asked for the coolest ride times possible and plan on bringing his ice packs and multiple fans, so we’ll see. But for now it just kinda feels like we’re in that “whittling time away until something fun happens” mode. One of the side effects of that mode is that I tend to start hunting for (and picking up) bargains. It’s a bad habit. First I got Henry a KK bit on consignment in the hopes that it would be some kind of Majikal Instrument of Dressage Amazingness. While he seems to like it, there’s no real discernible difference between it and the regular $25 copper lozenge loose ring I was using before. I also got him the navy DSB’s that I talked about last week, which I totally love and think everyone should buy immediately. I hope they hold up well over time because I have no complaints about them so far. Of course the new boots inspired me to search for a new dressage pad to match. Sadly, I’ve had no luck. I want something navy or that has navy on it, and isn’t ugly or boring or really expensive. I didn’t realize how many dressage pads are one or all of those things. What’s up with that? 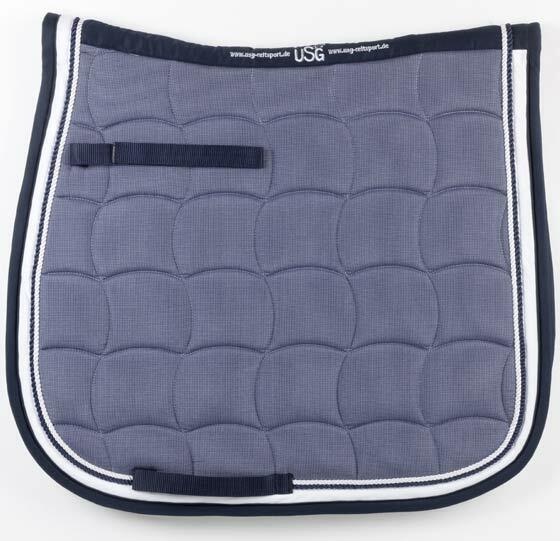 So far the only one I really like is this USG pad below, which is $52. My penny pinching self is having a hard time wanting to spend $52 on a saddle pad when my lovely $14 Riding Warehouse pads work totally fine. They just aren’t navy. Another thing I found on consignment was a Devoucoux cover. I’d been sorta kinda looking for one for a while for my dressage saddle… it came with a cover but not an official Devoucoux one, and Makila the Devoucoux said she really wanted to represent sa famille with a proper cover. I just didn’t want to pay $50 for that privilege. So when I saw one come up for $25 shipped I nabbed it, and Makila seems happy now. Then I found a pair of almost new Renard et Cheval breeches on ebay for $30. I can’t turn that down, even if I don’t really particularly need another pair of tan breeches… it’s good to have a spare, right? I dig the contrast knee patch and it turns out they fit me perfectly. These might be my new go-to tan pair. I wish I could find more in other colors. I also bought a new pair of tall boots. Not that I needed a new pair of tall boots, but when I wear black boots (which is often, because most of my breeches look better with the black ones) my only option is my Monacos. My expensive, beautifully fitting, yet kind of fragile Monacos that have already had the zippers replaced twice in the past 6 years. I really don’t want to have to replace those boots with something equally lovely (read: $$$) anytime soon, so it pains me to subject them to everyday wear and tear. When I saw the TuffRider Parwanti’s (ok that’s not the real name of them, they’re like Sport Dress Boots or something boring like that) on sale for $99, I figured I’d try them out. While there are some things I don’t love (the super rounded toe, the way you have to thread the zipper into the keeper to keep the zipper up, and legs that are cut to accommodate cankles) they aren’t bad little “beater” boots. They’re quite thin, so I don’t expect them to last a long time, but the benefit of being super thin is that they’re extremely comfortable. The footbed is nice and well padded too… it’s more like wearing half chaps and paddocks, but with the nice clean look of tall boots. For what I paid they’re pretty decent little boots, and they look nice enough. The last thing I got (I think. Unless more things show up that I forgot about. Which is possible.) is this Ariat shirt. I wanted it for the dressage show that ended up not happening, because I thought it’d look really cute with whites. I wasn’t wrong about that, it DOES look really cute with whites, and my navy and white Mango Bay anchor belt. The fabric feels pretty cheap though and is kind of scratchy. Luckily I paid next to nothing for it, so I’m ok with keeping it in case coats are ever waived or we finally end up at a schooling dressage show at some point. Oh yeah, and a “non-stuff” thing: I decided to try Henry on MagRestore for 10 days to see if I notice any difference. Extra magnesium is supposed to be good for horses that are tight and tense in the muscles, and overly sensitive/reactive to touch. I used to have Sadie on it because when she came into heat she would get so sensitive that she didn’t want to be touched, and it helped her, although I’m not super convinced it does a whole lot otherwise. Henry isn’t quite textbook for a mag deficient horse but he has a few of the typical symptoms. It was $20 and free shipping for the 10-day loading dose, and I should know by the end of the 10 days if it helps or not. If it does, great, if it doesn’t, oh well. Figured it was worth a shot. Expectations are low, so we shall see. Looooove those breeches with the contrast patches. Very nice! I secretly want the TS whites with tan kneepatches, but let’s be real I have no reason to wear whites. Sure you do! For as much as I resisted the whites, I actually really like them now. I’d rather wear white than tan! BoT makes a navy dressage pad, I love mine. Plus maybe you could justify it because of the majikal BoT properties. I’m kind of “eh” about Back on Track, and their navy pad is plain and boring and expensive. Maybe if I found one really cheap. It just doesn’t do it for me. Have you come across Greenhawk yet in your search for the perfect saddle pad? They have a lot of options. Prices aren’t bad, especially when on sale and their shedrow brand seems pretty good. No idea what duty and shipping would be like though. I looked there a little, but shipping is like $24. That makes it so not worth it. I know, it’s sad, because Greenhawk has some good stuff. We should have a blogger meet up here when Greenhawk has their huge warehouse sale. It’s a good time! Practically around the corner. lol! You seriously find the best deals!!! Horseloverz.com has a flash sale every so often. This last one was great. Scored Cowboy Magic shine and detangler for $4.99/ 32 oz. Maybe check them out for pads? I have Ogilvy and love that pad, but was looking for something a little more… snazzy? Unique looking? Gurrrll…I feel you on the navy saddle hunt. I looked at getting that USG pad and the matching bonnet, but $90+ for both is too rich for my blood. Luckily I don’t want the matching bonnet, but $52 for a saddle pad is still pretty rich for my blood. It’s hard to justify! I’m glad I’m not the only one that has forgotten what I bought by the time it shows up in the mail. Tack ‘hos for life! I am pumped for the navy DSB… I couldn’t help myself. Hopefully you’ll find a good pad sooner rather than later. Check out the Horze website (WORST name ever to pronounce..) but they’ve got pretty nice stuff for decent prices. Not super high end, but looks good & wears well. I’ve got one of their bridles for my horse & its beautiful, & I only paid $55 for it brand new. I looked at Horze, but the only one I actually liked that wasn’t super expensive only came in pony size! Btw, you can order Magnesium Oxide (made for animals) through a feed store. A 50lb bag is roughly $25… I had Riley on Quiessence while we were first working with his head shaking and once he got on the loading dose, I switched to the Magnesium oxide (which is 56% magnesium, so there’s a conversion you have to do) and I just add it to wet feed! I actually prefer Di-magnesium malate to MagOx. I’ve had a lot more luck with the chelated stuff (at least on the two horses I tried it with originally), it seems to absorb better and with a lower dosage. I’ve had great results with magnesium citrate – excellent absorption compared to oxide. Comes from bulkfoods.com. 5 lbs lasts me about 9 months. Where’d you find the Tuffriders? I’ve been thinking about picking up a pair. Dover has them for $99. Beware, the foot runs small and the calf runs big. I went up a half size in the foot and it’s barely big enough. I could have sized down in the calf, but they’re ok. I just got a purple USG pad on sale for $25 at a horse show. I really like those breeches! me too! Super comfy. They’re kind of like all the things TS *should* be, but that TS missed the mark on. Is the fit similar to TS? Yeah, but much improved for me personally. TS tend to be gappy in the waist on me (less in the front zips than the side zips, but still a bit gappy) and these have no gap. They say mid rise but they’re about the same rise as my low rise Trophy Hunters were. Much less crotch sag in these. Similar length, perhaps a touch longer. Softer fabric, about the same thickness. Horze has some relatively exciting saddle pads for under $50. The Toulouse and the River are the two that come to mind, and they’re ALWAYS having some kind of coupon sale. I wasn’t a big fan of the River but the Toulouse is ok. I wish it wasn’t so baby blue, but it would do. Unfortunately it’s only $7 cheaper than the USG pad that I really like. I dunno… I’m so meh about all of them. If you’re into embroidery, Centaur has a hibiscus (http://www.centaurhorsecare.com/saddle-pads/centaur-hibiscus-dressage-pad-469022) and a crown (http://www.centaurhorsecare.com/saddle-pads/centaur-royal-dq-dressage-pad-469020) design for $40. I’d offer to send you a Schockemoehle pad, because I really like them, but all we have in stock is a super boring navy with cream piping. I saw all the different Centaur and Roma ones but wasn’t really digging their designs. I’m too hard to please. I love the contrast on those breeches! So cute. What a large shopping spree. I’m itching now! i have a USG pad and love it! Super sturdy and well made. I saw a pair of Mt horse boots on Dover for 50%off I might need to buy.